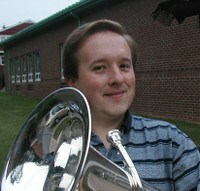 Lloyd E. Bone, Jr., euphonium, is currently Assistant Professor of Music at Glenville State College in Glenville, West Virginia, and Chairperson of the Department of Fine Arts. He teaches applied brass, music history and literature, brass methods, survey of music, conducts brass ensembles, and is the marching band, pep band, and concert band director. He is also currently the news editor for the International Tuba and Euphonium Association Journal and is co-editor of The Euphonium Source Book, the first definitive textbook regarding the euphonium. Prior college teaching experience includes a doctoral teaching assistantship at the University of Cincinnati College-Conservatory of Music where he taught brass methods, assisted with the Bearcat Bands and various music education courses. Mr. Bone was the adjunct instructor of low brass for Murray State University for two years, where he taught low brass and conducted the tuba and euphonium ensemble. Other teaching experience includes five years as low brass instructor at Music Makers of Cincinnati, four years as band director and general music instructor at the Schilling School for Gifted Children in Cincinnati, and as a band director and substitute teacher for the Chattanooga City Schools and Hamilton County, Tennessee School District. As a euphonium player, Mr. Bone was a guest artist at the 2010 International Tuba and Euphonium Conference (ITEC) in Tucson, Arizona, and also conducted the Glenville State College Tuba and Euphonium Ensemble, one of a small number of ensembles from around the world invited to perform at the conference. He recently performed as a soloist at the 2008 ITEC, and was head judge for the ITEC Euphonium Young Artist Division Solo Competition, and also conducted the Glenville State College Tuba and Euphonium Ensemble at the conference. He performed with Euphoniums Unlimited on their first recording. At the 2006 ITEC in Denver, he performed with the Red Rocks Tuba and Euphonium Ensemble, an ensemble of select tuba and euphonium professors from around the United States. He also performed with the Tennessee Tech University 40th Anniversary All-Star Alumni Ensemble in Chicago, the United States Army Band Tuba and Euphonium Conference, and Carnegie Hall. Mr. Bone attended Tennessee Technological University where he studied with R. Winston Morris, toured, performed, and soloed with the internationally acclaimed Tennessee Tech Tuba Ensemble, and received his Bachelor of Music Education degree in 1995. He received his Master of Music degree from the University of Cincinnati College-Conservatory of Music (CCM) in 2001. At CCM, he studied with Timothy J. Northcut and served as principal euphonium in the Wind Symphony, Symphony Band, and Brass Choir. In 2002, Mr. Bone began pursuing his doctorate at CCM and is still in the completion process.